An innovative tax on business financial transactions could deliver millions of pounds for cash-strapped Welsh councils, according to UNISON Cymru Wales. We are urging local authorities to join the campaign for a Robin Hood Tax, which could provide much-needed funds for vital community services. Public services such as libraries, youth services, parks and leisure services and environmental and food hygiene services have been damaged by UK Conservative government austerity and are in danger of withering away completely unless urgent investment is found. The Robin Hood Tax, a small tax paid on financial trading, would provide enormous funds for Welsh public services at no financial cost to the overwhelming majority of the population. “Brutal UK Conservative government spending cuts over the last seven years have brought Welsh public services to crisis point. They are under threat of extinction as austerity continues. 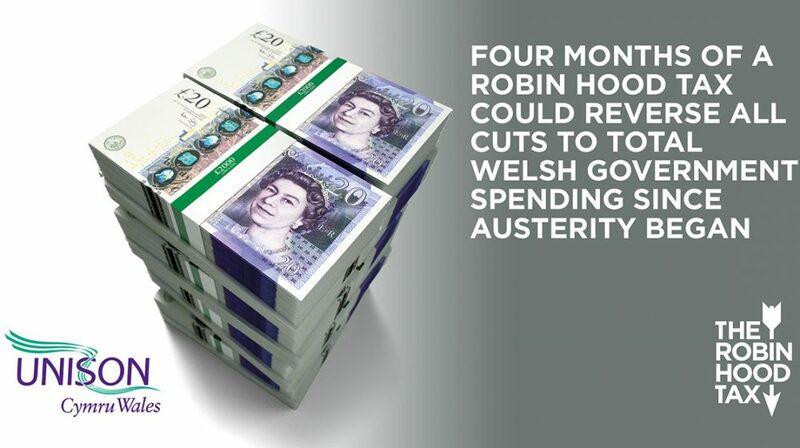 We want you to write to your Assembly Member and MP urging them to support an end to austerity; the introduction of a Robin Hood Tax and fair funding for Wales. Download our Fair Funding for Wales model letter here. Download our Robin Hood Tax briefing here. Currently, there is a tax on the purchase of shares which delivers £3bn to the UK exchequer each year. The Robin Hood Tax would close current loopholes on the Stamp Duty on shares and extend the tax to derivatives. This could raise £25 billion1 of additional revenue every five year parliament, potentially providing a new source of funding for local councils. The Robin Hood Tax is endorsed by a thousand economists, Bill Gates, Angela Merkel, Desmond Tutu, Michael Moore, Bill Nighy, Sienna Miller and Emma Thompson. It is official policy of the UK Labour Party and the Democrat Party in the USA.